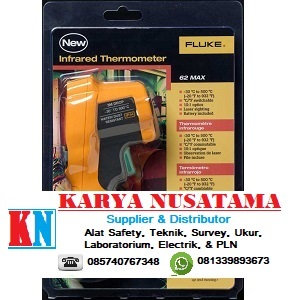 Hubungi Karya Nusatama 085740767348 / Wa 081339893673 untuk pemesanan Fluke 62 Max Plus Infrared Thermometer Negative 30 °C to 500 °C di Padang, selain itu kami juga menjual berbagai alat listik, penangkal petir, alat safety, alat teknik, alat ukur, alat survey, alat geologi, sirine, alat optik, lampu emergency, alat hydraulic, safety shower dan lain sebagainya. Free ongkir khusus untuk daerah jakarta dan sekitarnya. The experts at Fluke proudly debut the newest additions to their line of infrared thermometers! Use the Fluke 62 MAX and MAX Plus to quickly and accurately detect hot spots in hard-to-reach or hazardous areas. Improving upon the popular Fluke 62, the Fluke 62 MAX and 62 MAX Plus are ergonomically designed for a more natural hand fit. Rugged and accurate, both models are IP54 rated for dust and water resistance. Each model is small and lightweight, so it can easily clip onto your belt loop or fit easily in your tool box. The 62 MAX and MAX Plus are the only infrared thermometers that can survive a 9.8 foot drop, making them the only IR thermometers that you can handle without care! The Fluke 62 MAX single laser IR thermometer features a 10:1 optical resolution and a 10 hour battery life. Other features include a large easy-to-read screen, backlit display, and Hi and Lo alarms for rapid display of measurements outside the limits. Each model is powered by a single, standard AA battery.